This is one of my favorite runs in the East Bay. This section of the Bay Trail is a dedicated path, right along the water, around Bay Farm Island’s nearly 6 mile circumference. There are terrific views of the water, Bay Bridge, and San Francisco along the way. There are mile markers every mile. The best section of the trail is between the pedestrian bridge linking to the island of Alameda at the northern end (Doolittle Dr.), through Shoreline Park, for the first three miles heading south. There’s a ferry to San Francisco at the Harbor Bay Isle Ferry terminal. Add-On: North: over the pedestrian bridge, along Shore Line Dr. – nice running path along Crown Memorial State Beach. 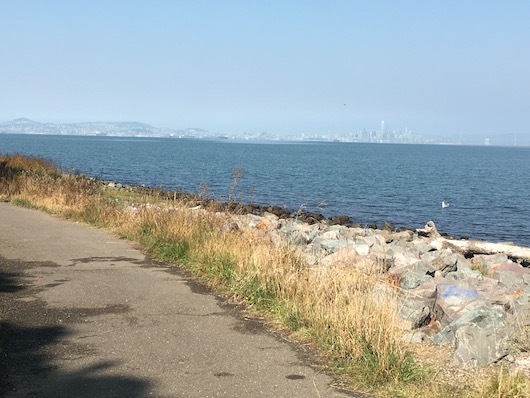 South: continue along the Bay trail along Doolittle Dr. toward San Leandro Marina Park.